LED matrix headlights aren’t legal in the U.S., but they may be allowed soon. If a recent National Highway Traffic Safety Administration (NHTSA) proposal becomes law, federal regulations will permit adaptive driving beam (ADB) headlights on new cars, Bloomberg reports. Published Friday, October 12, the proposed amendments to the Federal Motor Vehicle Safety Standard (FMVSS) Number 108, Lamps, Reflective Devices, and Associated Equipment, will permit the change. Why should you care? Adaptive vehicle headlights can provide vastly improved visibility of the road ahead without directing blinding glare at people or other vehicles in front of you. The technology in the so-called “matrix LEDs” consists of a grid of individually controllable lights. When sensors detect an object in front of the vehicle, the specific LEDs that would project light directly on the object shut down while the rest stay on. At CES 2018, German lighting company Osram introduced the Evivyos adaptive headlight comprising 1,024 LEDs, each of which can be turned on or off. “The idea of this is almost like an always-on high beam,” Osram CEO engineer Matthew Zajac explained to Digital Trends at CES. “You adapt your beam to traffic,” Zajac continued. 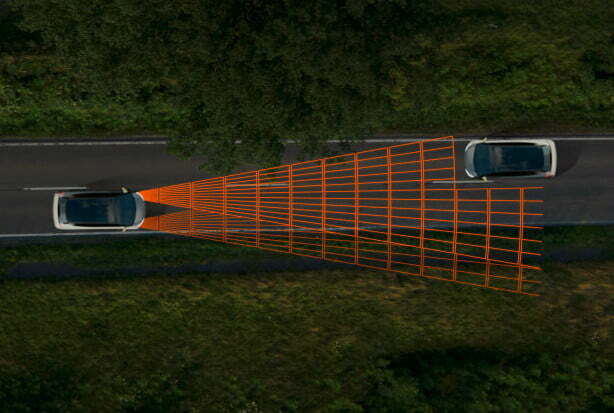 As seen in the image below from Osram, the headlights would illuminate the lower body of pedestrians and vehicles, but the LED that would shine in people’s eyes would shut down. Toyota originally petitioned the NHTSA in 2016 to give manufacturers the option to equip vehicles with adaptive driving beam systems. In presenting the proposed rule change, the feds gave Toyota the nod. “NHTSA has granted Toyota’s petition and proposes to establish appropriate performance requirements to ensure the safe introduction of adaptive driving beam headlighting systems if equipped on newly manufactured vehicles,” the proposal states. The NHTSA proposal requires ADB systems meet standards for visibility and glare prevention. In addition to allowing matrix LED headlights and setting standards for high beam and low beam visibility and glare, the proposal also includes building and equipping a test track with laboratory-tested devices to measure the performance standards. The NHTSA is asking for comments on the proposal. You can submit comments online, by mail, hand delivery, courier, or fax. The proposal includes complete instructions for comments. All comments need to be submitted in time for the NHTSA to receive them by December 11, 2018.